Probiotic – a microorganism that enhances a person’s health. That’s the basic definition. Probiotics are the “good bacteria” that are found in the gut. Such bacterium kills off bad bacteria and promotes healthy, good bacteria growth. If the Probiotics are not up to par in the gut, numerous problems are likely to arise, including but not limited to, autoimmune disorders, anxiety, depression, and allergies. If a healthy diet filled with probiotics and fiber is maintained, the gut will have little to no problems keeping up with the riddance of bad bacteria. The majority of the time, people assume that taking probiotic supplements is the way to go. It’s easy to keep up with and convenient for most. But, what if I told you there’s a way to incorporate probiotic rich foods into your diet, instead of taking an additional capsule each day? What if there were natural ways to consume that good bacterium that keeps you healthy and constantly kicking? Well, there is. Check out the following foods that will boost the probiotic count in your gut even more than a supplement will. 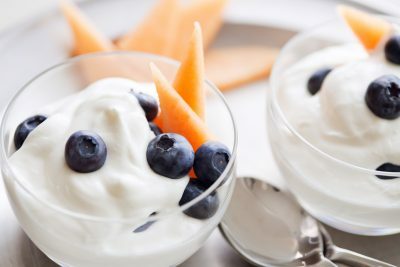 Yogurt is a huge probiotic booster for your stomach. This dairy product contains live cultures and active cultures such as lactobacillus bulgaricus. This bacterium makes lactic acid in the stomach to keep the bad bacteria from doing its harmful job. Out of all yogurt types, Greek yogurt would be the healthiest and most beneficial choice for your gut. This yogurt has the least amount of sugar and sodium within it. And, to add to the positives of Greek yogurt, it is proven to contain more protein within a little container compared to any other yogurt. We all know that eating hot dogs is a bad decision. All areas of a pig combined into one little wiener of meat is not a healthy choice. However, the condiment sauerkraut that’s often put on hot dogs is healthy for you, specifically healthy for your stomach. When lactic acid ferments, it produces an edible product known as sauerkraut (the hot dog condiment loved by many). During the lactic acid fermentation process, the bacterium present takes sugar within the general area, and turns it into lactic acid. By following through with this process, the gut grows stronger, in turn making it hard for the bad bacteria to inhibit and grow in the stomach. Additionally, sauerkraut is an excellent food choice due to several facts. 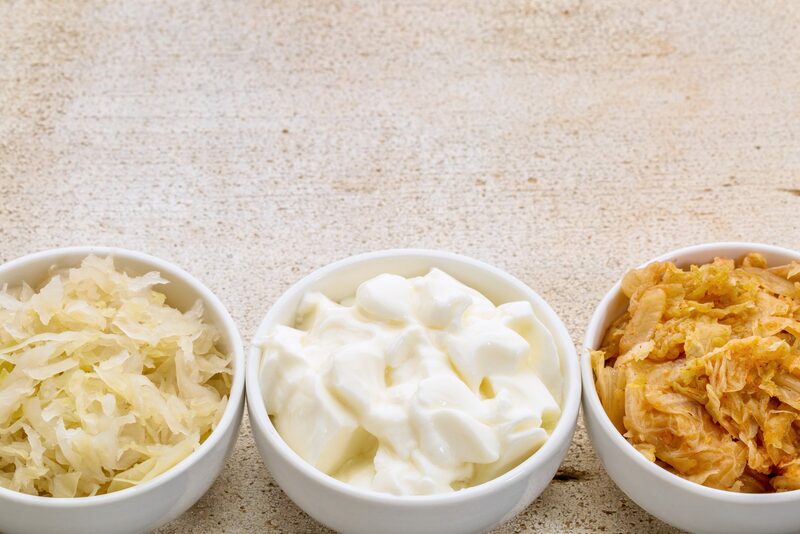 Nor only does the well known condiment only contain 30 calories per cup, it also contains vitamins A, C, & K. Even still, sauerkraut has a sufficient amount of fiber and iron within it to give you that extra boost. So, even though it’s excellent for your probiotic intake, try your best not to load it onto a hot dog. Instead, find a different protein source that meshes well with the condiment and try it out. I don’t know about you, but whenever I’m at a bar or a pub, and the person next to me has a pickle on their plate that they don’t want, I’m the first to grab a hold of it. Hey, they’re delicious. Pickles are a great way to get your probiotic intake. Not only do they help promote good bacteria growth in the stomach, but they also are low in both fat and calories, making them a guilty-free pleasure and probiotic booster. In addition, pickles have high fiber and contain vitamins A and K. The only not-so-good part of eating pickles all the time is their high sodium levels they carry with them. So, you can eat a few pickles, but make sure to eat them in moderation, as you don’t want your cholesterol going through the roof. For those of you that don’t know what kombucha is, it’s a fizzy/sour tea. And yes, this type of tea has a plethora of probiotics within it. 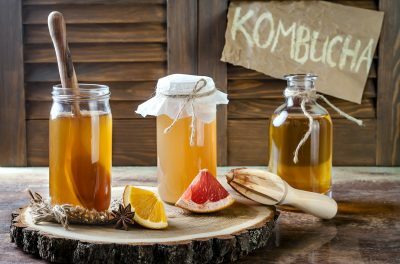 Additionally, kombucha has a variety of B vitamins. These B vitamins give the body an immunity boost and help prevent heart risk factors from coming into play. However, this fizzy, sour tea should be limited, as it contains approximately three teaspoons of sugar in each bottle. If this is your only sugar intake on a regular basis, your diet will not suffer. But, if you eat other foods with regular or high amounts of sugar, watch out how much kombucha you drink. Tempeh is similar to a granola bar, yet it does have several differences. What I mean when I say it’s similar to a granola bar, is that it takes the shape of a formed patty the way such a bar does. However, instead of being created from oats, this patty originates from fermented soybeans. This probiotic booster does a hell of a lot more than just promote good bacteria growth within the stomach. It’s extremely high in protein, which is good for healthy muscle gains! It also helps repair and build muscle sufficiently, while keeping your stomach full. Another benefit? Tempeh reduces bad cholesterol levels. As you can see, the benefits are continuous. And, if you are hesitant to eat tempeh, remember that all tempeh can be seasoned and spiced up with any ingredient due to its ability to soak in flavors of all sorts. It is actually recommended to add tempeh to dishes such as soups, stir-fried foods, and sandwiches to get an adequate amount in your overall diet. Miso is also a probiotic booster, and it is also made from soybeans, just like tempeh. You may recognize it from the famous miso soup that most Asian restaurants serve. However, miso is not only popular for its delicious soup; It’s also popular for its ability to provide a great source of antioxidants to the body. Along with antioxidant advantages, miso contains anti-inflammatory benefits, too. It is said that such properties of miso can actually reduce risk of cardiovascular disease and stroke.